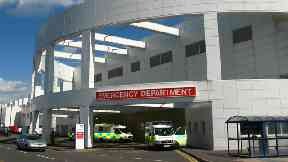 A number of patients died following cardiac surgeries at the Edinburgh Royal Infirmary. Infections contracted by six people who underwent heart surgery at an Edinburgh hospital were related to mould, the health secretary has said. Jeane Freeman told MSPs at Holyrood that three different types of mould infection had been identified in the patients - who all had cardiothoracic surgery at Edinburgh Royal Infirmary between March 2018 and November 2018. NHS Lothian said some of the patients had died, although the health board insisted it was not allowed to publicly state the exact number. Health Protection Scotland first advised on February 19 that one patient who had undergone the procedure had contracted a mould infection, Ms Freeman said. A month later, on March 19, bosses at NHS Lothian wrote to 186 people who had undergone the procedure to warn them of a "low infection risk arising from their surgery". Ms Freeman said that none of the types of mould involved were "commonly found in hospitals". She confirmed: "Three types of mould infection have been identified which have affected six patients. Sadly some of those six patients have died." With the news coming in the wake of infection-related deaths at the £842m Queen Elizabeth University Hospital in Glasgow, opposition MSPs said confidence in the NHS had slumped. Scottish Liberal Democrat health spokesperson and Edinburgh Western MSP Alex Cole-Hamilton said: "Almost 200 patients have received these warning letters and are no doubt anxiously awaiting updates. "People have been left worried about the safety of hospitals after the recent spate of reported infections. "The government needs to urgently establish where these moulds came from. That's the only way we're going to learn lessons and ensure this never happens again." Scottish Labour's Monica Lennon added: "Unfortunately, here we are again. It's a different hospital, a different city, different infections, but the outcome is the same - patients have died and public confidence continues to dip." NHS Lothian has ordered specialised cleaning and environmental decontamination with in relevant wards and theatres of the hospital after the infections were discovered, Ms Freeman said. She said the source of the infections had yet to be identified. "Once we have identified the source there will be lessons to be learned from that," she added. "Healthcare associated infection outbreaks are rare and whilst it is important to respond when they do occur... they do affect a very small proportion of the 1.2 million in-patient and day cases treated every year in Scotland." The health secretary added: "Not all healthcare associated infections are preventable. But we do have dedicated professionals and a rigorous system focused on limiting them and controlling them."